Campers enjoy time at Hog Island State Forest Campground. Photo by: Dave Kenyon, Michigan DNR. 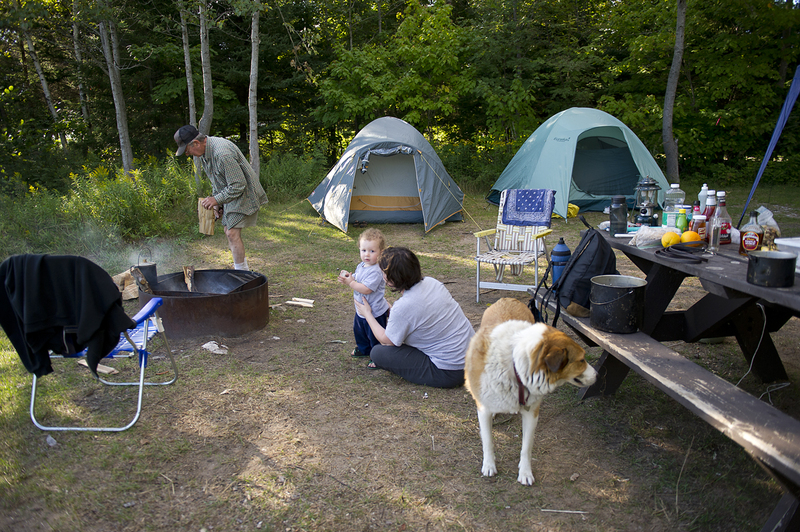 Michigan’s state forest campgrounds will get the start of a facelift in 2013. There are changes ahead, not the least of which are better outhouses, fire rings and picnic tables at campgrounds most in need. The hand-me-downs will save money in the short-run, while bettering the rustic campgrounds, Sylvester said. The replacement pieces would otherwise be discarded as various state parks upgrade to meet Americans with Disabilities Act requirements. The rustic camping program was merged with the state park program in spring 2012. It was moved out the agency’s Forest Resources division where it had languished for years due to a lack of funding. State parks staffers say their first season of operation, in cooperation with FRD staffers, provided insights on ways to improve the facilities. State park staff began by focusing on customer service. They made more frequent rounds of the rustic campgrounds and interacted more with campers, Schreiner said. They also more regularly collected fees and met with campers where there were payment mistakes. State forest campgrounds operate on an honor-system. Campers pull in, grab a registration envelope, and drop their payment into a pipe. FRD staff had estimated that 30 percent to 50 percent of them were not paying, but Schreiner said the problem was nowhere near that large. Campers can expect to see other changes as well during the 2013 camping season. Four of the 132 rustic campgrounds are operated by local entities under lease agreements. More are likely if partners can be found, Schreiner said. It will also be a year of “right-sizing” the program to save money without having to close down campgrounds. “We said we were not going to close anything in the merger, but at some facilities we have more facility than customer base,” Schreiner said. Between 12 and 20 campgrounds may be reconfigured to better match current use. That can mean consolidating two into one or making some smaller to reduce maintenance costs. Schreiner has asked DNR field staff for recommendations about size, whether to shrink, enlarge or maintain status quo. That information, he said, will be compared to recommendations that were made by a special “right-size committee” that was convened in 2010 to look at those questions. Advanced reservations for 12 of the rustic campgrounds will be discontinued due to a lack of interest by campers. The reservation system was launched last spring, but campers were largely unimpressed. They complained about added costs and did not find the service useful. Reservations will be accepted only at four locations in 2013. Those are: the rustic cabins at Little Presque Isle in Marquette County, Elk Hill Trail Camp and group camping in Pigeon River Country, Lake Margrethe State Forest Campground in Crawford County and Big Bear Lake/Big Bear Point State Forest Campground in Otsego County. Despite the intense summer heat in 2012, a condition that drove campers to rustic sites by water leaving many dry campgrounds nearly empty, more campers used the system than in 2011, according to Schreiner. The number of “camper-nights” rose from 75,000 in 2011 to 80,000 in 2012. This entry was posted in Uncategorized and tagged Big Bear Lake, Camping, Elk Hill Trail Camp, Lake Margrethe, Little Presque Isle, Michigan Department of Natural Resources, Pigeon River Country State Forest, Rustic Camping, State Forest Campgrounds, State Forests, Traverse City State Park. Bookmark the permalink.